Description: Larger than their weight would indicate, porcupines can grow to 1m (3.3) feet in length while weighing only 10kg (22lbs). Second in size to the beaver, porcupines are unlike any other North American rodent due to the sharp keratinous quills that cover their neck, sides, back and tail. These barbed quills range in size from 1cm (0.5in) or less, to about 7.5cm (3in), depending on where they are found on the body; the longest quills grow along the lower back and tail. Porcupines can raise many of their 30 000 quills when threatened, through contracting tiny muscles in the skin, but quills are only removed through contact; porcupines are unable to throw their quills. Clumsy on the ground, porcupines have large bodies, and short legs. Once in a tree, however, they are agile, albeit slow and deliberate, using their long claws to help them climb. The porcupine coat is typically dark brown in colour, while quills have paler tips. 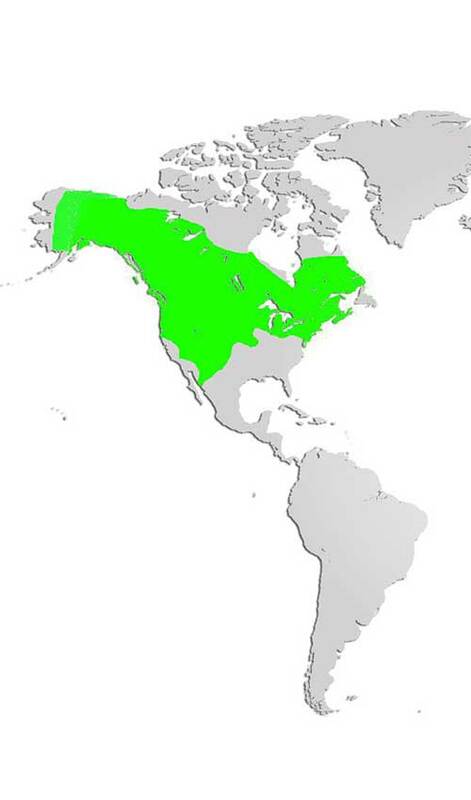 Distribution and Habitat: Porcupines are commonly found in coniferous and mixed forest areas across North America, with the exception of island forests. Like most animals, they have adapted to the presence of humans and can be found denning under cottages, or eating garden shrubs and other cultivated plants. Diet: Herbivores, porcupine prefer buds, needles, small twigs and the inner bark of a variety of coniferous trees but can be found grazing on shrubs and other plants. Like other rodents, they require resistant materials to chew on in order to keep their permanently growing front incisors from becoming too long and impeding their ability to eat. Life Cycle: Although primarily solitary, porcupines can be found denning together in large groups during the winter. Interaction is minimal, even during mating season in the autumn months. Female porcupines give birth to one young after a 7 month gestation period. Newborn porcupines have a full coat of hair, including short, soft quills. Their eyes are open and their teeth are emerged. Growth is rapid, weaning occurs after only a few weeks, and young porcupines disperse from their mothers by the fall, fully mature and ready to mate by the time they are 2 years old. Adaptations: While the most obvious survival adaptation of the porcupine is its quills, this barbed and re-growing protection is not their only interesting characteristic. The first digit on their hind foot is uniquely shaped and padded, to allow a firm grip while climbing. Porcupine skin contains an antibiotic-type substance that prevents infection when they impale themselves with their own quills, or those of another porcupine.